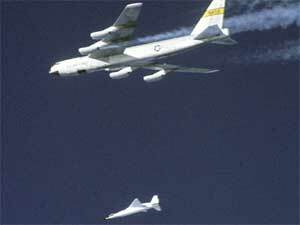 An X-43A hypersonic research aircraft and its modified Pegasus booster rocket drop away from NASA's B-52B launch here Nov. 16. The mission originated from the National Aeronautics and Space Administration's Dryden Flight Research Center at Edwards Air Force Base, Calif. Moments later the Pegasus booster ignited to accelerate the X-43A to its intended speed of Mach 10. 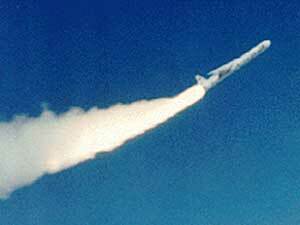 After the release from the L1011, rocket motors are ignited and the Pegasus proceeds to the planned orbit. The whole procedure takes about 10 minutes.